A hefty daily intake of shiitakes - scientific name: Lentinula edodes - may help you avoid getting fatter. According to an animal study, which Australian researchers published in the Journal of Obesity in 2011, the mushroom inhibits the growth of fat tissues if rats get more energy than they can burn. The researchers gave young male rats feed for 6 weeks in which they had put extra fat. Rodents get fat from high fat feed. Some of the rats also received shiitake powder through the feed. If the rats had been humans, the animals with the highest concentration of shiitake would have received about 34 grams of shiitake powder every day. That corresponds to 340 grams of fresh shiitakes. The more shiitake the researchers put into the feed of their rats, the less fat mass they built up. The more shiitake the test animals had received from their feed, the smaller their fat mass was at the end of the experiment. That effect was stronger than the effect on their total body weight. Perhaps shiitake has a body recompositioning effect, and the mushroom not only reduces the fat mass, but also increases the fat-free mass. The researchers have not studied how exactly shiitake inhibits the growth of adipose tissues. 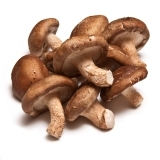 One possibility is that beta-glucans in shiitake reduce the absorption of fat from the diet. Another possibility is that bioactive substances in the mushroom change organisms' metabolism. One of those substances may be eritadenine. Eritadenine is a component of shiitakes, which is known to lower cholesterol levels. And maybe it does more. "Further study is necessary to elucidate the underlying mechanisms and the possibible active components of Shiitake mushroom", write the researchers. In addition, they plead for human trials. If these trials have positive outcomes, then maybe we have a supplement or functional food that prevents overweight and obesity. These in-vitro studies show that piceatannol inhibits the uptake of glucose by fat cells, but stimulates its uptake by muscle cells. So can carnosic acid help to break down fat tissue and build up muscle tissue? Perhaps it can, we think after reading this animal study. Spectacular animal study. No more, no less.